Welcome to Episode 3 of The State of You – I am Bindi – in this episode we are going to talk about mindfulness and mental health – particularly in the workplace and give you some tips on living in the moment, letting go of anger, dealing with depression and rejection and creating self-worth. A lot of the philosophy behind episode 3 is thanks to the late Dr. Wayne W Dyer – check out my links page for more details. So often we hear people say – If only I had this or if only I could do this or I’m going to be happy when I reach this milestone or I’ll be happy when I get this or that. In workplaces, we often see what I like to call doomsday preppers – laying out the red carpet for disaster to happen. All the while they are wasting the present moment on what could be or what has taken place – and often what could be never happens. All those things are happening in the present while you fill it up with what could be and if only’s, instead of filling it with gratitude and being here now. How do we live and remain in the present moment? Well in all honesty – all that we have is now – this moment – that’s our relationship with life. It’s been said by people who have had near death experiences that everything is now – be in the moment and treasure it – you’re in this moment whether you like it or not – it’s all you have. Choose not to fill it with worry, stress or anxiety – choose to make the most of it. Live in the present moment by practicing meditation, showing appreciation and understanding that everything that’s happened to you hasn’t happened in the past or the future – it’s now. Stay in the present moment and be grateful for everything you have now. I mentioned in my last episode about the law of abundance – give as much away as you can – the more you give away – the more you will receive. This can be as simple as giving away your time and energy – not necessarily money. Make others’ present moments as happy as you would like yours to be. How often have you driven to work and you totally don’t remember every turn or even the entire journey? How often do you get ready of a morning and don’t remember brushing your teeth or putting your shoes on? How often have you sat on the couch for a Netflix binge and ate a whole bag of chips without recognising what they tasted like? Did I just hear you say oh my god Bindi – so many times! Well if that’s the case – you are on autopilot, my friend. So many of us can attest to this on a daily basis and it just feels like we are a human doing – not a human being. We are just going through the motions – getting from one task to the next – the next deadline – the next day. Feels kinda numb right? I am going to give you some tips on how to practice mindfulness and snap you right out of autopilot that you can squeeze into your day – no matter how busy you think you are. So what is mindfulness? Mindfulness is all about focusing on the present. By getting into the habit of practicing mindfulness, it can help you to reduce stress, improve wellbeing, focus, and self-awareness. First – focus on what you are doing right now – or are you too busy walking down the street while checking out Insta on your smart phone? Let me stop you right there – stop! Focus – are you walking? Put the phone away – focus on walking – if you’re driving – you better be focusing on what you are doing – even if you’re just brushing your teeth – focus on the present moment – not how many emails you have to deal with when you get to the office. Check in with yourself – how do you feel? What do you need? Are you tired? Are you hungry, cold, hot, anxious? Recognise that and address what you need. Concentrate on what is happening around you. Is there a severe storm on the way and you are oblivious to the fact? Is it raining and you forgot your umbrella? What can you hear – what can you smell? Attune your senses to your environment – be aware! Try mindful meditation – sit quietly, close your eyes, focus on your breathing, let your thoughts go and feel every part of your body relax bit by bit. Breathe in and out gently – I often find going to my happy place helps – for me – it’s the beach – so I imagine the sound of the waves – it’s like the ocean breathing, smelling the sea air and knowing nothing else matters right there at that moment. There are apps you can use to keep you focused on your meditation – try Headspace or Smiling Mind for guidance. Breathing – focus on your breathing for about a minute or so – as you do, imagine breathing out any stress you hold and take in cleansing breaths. If you have a smart watch – these come equipped with mindful breathing apps or you can try the Reach Out Breath app. Get into the habit every day – set aside a time every day just for you – even if it is just when you take a bathroom break. I wanted to take a moment to talk about anger. Often in the workplace, people can do things that irritate us or make us downright angry. In all honesty – the workplace is not a great space for anger to be let of the chain by any means. Outside of work, things can be happening that have angered us that can impact our work, so it’s important to know how to let go of that anger. If you’re experiencing anger towards others for what they’ve done to you or someone you care about – it serves no purpose to hold on to that – let it go – forgive them – clearly, they didn’t know any better. By hanging on to that anger over something that has already passed – you’re only going to hurt yourself more than those who made you angry actually did. Let it go. It was Jesus who said – forgive them, for they know not what they do. After my Grandma died, I felt a lot of anger for many years over a family discord that took place. I thought it was my place to stick up for Grandma seeing as she wasn’t here to do it herself. As a result, we lost communication for many years with family members we should have been beside and helping each other to heal in this grief. Only in recent years did we forgive and let it go which we were thankful for, as those family members are no longer with us. After a recent relationship breakdown, I thought I could never feel greater anger after what had happened. I tried to not take it out on them – but they had hurt me so much. It didn’t take long for me to see that I just needed to forgive them and let it all go as there was no resolution and never would be. I realised they had no clue what they were doing and I harnessed their cruel words to motivate me to rise above and show them I was never going to let anyone treat me that way again. This leads me to self-worth… the moment you realise you are exactly the way you’re supposed to be and everything that has shown up in your life has shown up on time – just like the way the sun sets and rises each day on time – you get it. The only choice you have is how you process those things that come into your life. Watch what you wish for – what you focus on becomes your reality. You get what you set – what you put out into the universe will come back to you. Have you ever noticed when you’re in a bit of a rut and you’re filled with anxiety, worry, negativity – that all the bad things seem to happen to you? Some people – this is their life story. You can choose to turn it around a day at a time. Recognise all you have to be grateful for, take the time to practice self-care – this can be as simple as having a bubble bath, getting a massage or eating well and respecting yourself enough to know you deserve the best treatment from yourself. So often I see – particularly women obsessing over junk food and how they deserve this treat – is it a treat? Really? That Nutella donut loaded with sugar and saturated fat – is that how you respect your body? Give yourself the respect you deserve and expect and watch what happens. Let me just also say here – that I understand this particular example has a lot to do with your relationship around food and whether it is treated as fuel – we will talk about this in a future episode. You deserve respect, from yourself and others – you are worthy of care and of love – mostly from yourself. Don’t let others define your opinion of yourself – it’s all about you baby! Since I started seeing a Naturopath about 2 months ago – hello to Alex from Healing Hands – she will be a guest in future episodes – so please look out for that – since I started taking a look at how nutrition can heal you, my relationship with food has completely changed and it has greatly helped my holistic outlook on life, my mental health, how I cope with stress, reduce inflammation and to ultimately live my best life. I urge you to keep an eye on your nutrition and take the time to learn how what you eat impacts your entire wellbeing. Lastly, I also wanted to address depression. I think we really need to break the stigma around depression, particularly in the workplace. We seem to think that it’s not a real illness, but believe me, it can be debilitating for those who experience it. In my career, I have experienced workplace bullying first hand and it is one of the worst things you can go through – particularly if you want to address it and report it. I won’t go into detail here – but it was a long and arduous process that at its worst point had sunk me into a deep depression – to the point of me not knowing where I was or where I was going on a daily basis. I had lost who I was and what made me function and I had to take a period of time off to try and get better. It was scary and at the time it felt like nobody cared and nobody could do anything to help me no matter how much I tried to reach out. One thing to remember is to give yourself a break – when it seems everybody else is keen to take a shot at you – there’s no need for you to join the queue. Be kind to yourself – you need to believe that you are destined for better things than what you are going through right now. Harness the power of what has happened and ask yourself – what can I do with this? If you’re experiencing things like rejection – just know it happened for a reason – it wasn’t the right time, the right fit and it will open you up to exactly what is intended for you. If you or someone you know need help, visit the links page on my site at www.thestateofyoupodcast.com. There’s a myth that you need to sink heaps of money into counseling, that’s not true – there are free resources available to you – most employers can also help you with this. When it comes to mindfulness – live in the present – practice mindfulness daily – put down the phone. Be a human being, rather than a human doing. If you’re experiencing depression – please give yourself a break, be kind to yourself and take that rejection and turn it around to open doors for you. Let go of the anger my friend – let it go and forgive. Bolster your self-worth – respect yourself, practice self-care. You get what you set. You’ll see it when you believe it. Thank you for taking the time to listen. I hope you have gained some useful tips and insights about mindfulness and things we can do to help our mental health in the workplace from episode 3 of The State of You. If you would like to share your story, please head to my website at www.thestateofyoupodcast.com and send me an email. If you would like more information, visit the links page on my site. 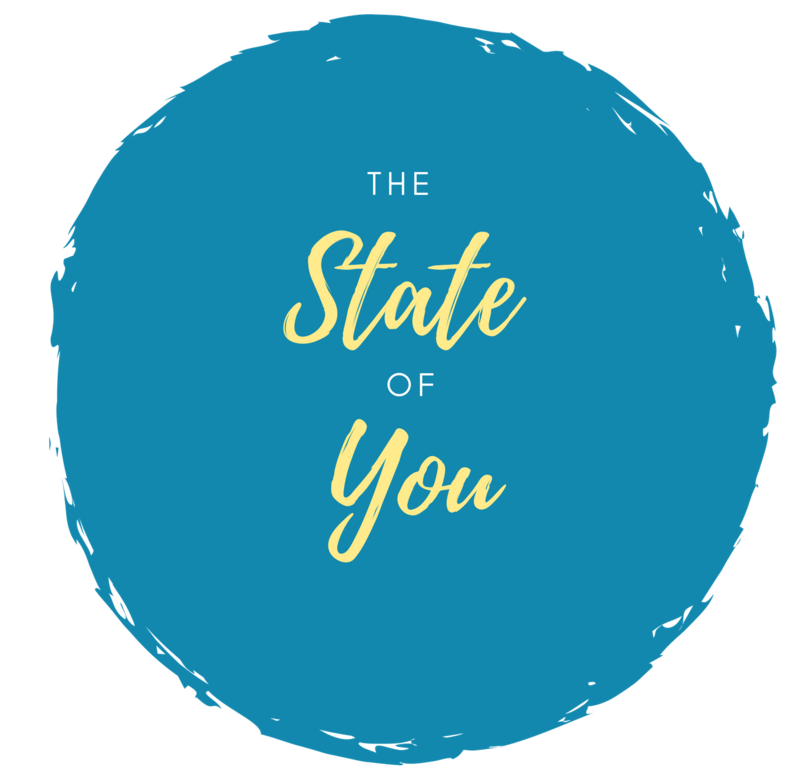 If you enjoyed episode 3 – please share your feedback – you can find me on Instagram @thestateofyou or subscribe to the podcast through my website. Previous Episode 2 – Where do we start?